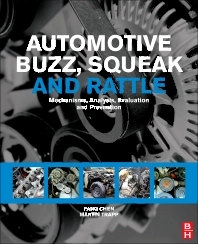 Buzz, squeak, and rattle (BSR) is the automotive industry term for the audible engineering challenges faced by all vehicle and component engineers. Minimizing BSR is of paramount importance when designing vehicle components and whole vehicle assemblies. This is the only book dedicated to the subject. It provides a self-contained reference to the background theory, testing, analysis, and elimination of BSR. Written for practicing engineers and industry researchers, the book has a strong focus on real-world applications making it an ideal handbook for those working in this important area. Chapters from leading experts from across the motor industry—with input from the design and research labs of Ford, Toyota, Daimler-Chrysler and GM—review the techniques available and provide readers with the appropriate physics, structural dynamics and materials science to address their own BSR issues.